Hazardous material storage can sometimes create dangerous situations at the workplace. A hydrochloric acid spill has occurred in San Antonio, TX at Blue Line Corporation, a manufacturer of inorganic salts based in San Antonio. Authorities were alerted the morning of Friday, August 16 after 200 gallons of hydrochloric acid, a corrosive substance, was spilled at the facility. No one was injured, although two reported feeling ill. The hazardous material was contained without incident. Certain substances, such as hydrochloric acid, can be highly dangerous. Hydrochloric acid is not only corrosive, but also fumes. Breathing in these fumes can cause adverse health effects, so it’s important to limit exposure to the substance. Hazardous material storage should be designed to minimize these risks, even containing spilled substances so that personnel and visitors are not at risk. Mechanical ventilation can serve to minimize the amount of fumes within your storage area by exchanging the air, regularly bringing fresh air into your personnel’s breathing zone. Proper storage of hydrochloric acid is critical and heeding pertinent regulations can prevent hazardous incidents. 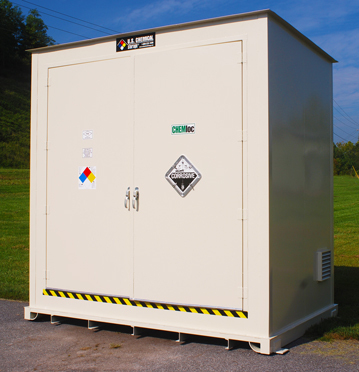 Hazardous material storage from U.S. Chemical Storage is engineered for the highest protection, maintaining your hazardous substances and minimizing your personnel’s exposure to potentially harmful materials. With our industry-leading, fully customized hazardous material storage building, any leaks or spills are contained by our leak-proof containment sumps, built to your specifications by our experienced staff. We take into account any hazards associated with your specific chemical storage needs – whether or not your hazardous material is flammable, explosive, reactive, corrosive and much more. We can help you streamline the process. Our aim is to help you attain compliance, reducing the potential for leaks, spills, and chemical reactions, and protecting your personnel against dangerous situations.